UDR's first call-out for full time service. ‘Northern Ireland’ consists of six of the nine counties of the Province of Ulster and remained part of the United Kingdom when the rest of Ireland became independent in 1922. The latter became what was then called the 'Irish Free State', and is today 'The Republic of Ireland'. The Government of Northern Ireland was established in 1921. It is usually referred to as ‘Stormont’ after the grounds of Stormont Castle, where its Parliament building is located. 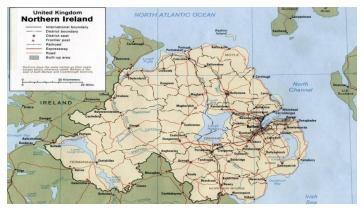 ‘Ulster’ is historically one of the provinces of Ireland, the others being Munster, Leinster and Connaught. Therefore it is not correct to describe Northern Ireland as ‘Ulster’, nor as ‘The Province’ as the latter two, being one in the same, are shared historically by both the Republic of Ireland and Northern Ireland. The description 'Island of Ireland', although strictly geographical, is an accommodation employed where matters concerning both jurisdictions are shared, for example, the players of the Irish Rugby Football Union's International Team are found from across the Island of Ireland. Operation BANNER was the United Kingdom's military operation in Northern Ireland that began on 14 August and ended on 31 July 2007. The first deployment was in response to a request from the government of Northern Ireland. Following the widespread public order earlier in 1969, deployment was to support the Royal Ulster Constabulary (RUC). The 1970s saw the number deployed peak at some 21,000 with units undertaking what were known as emergency tours from bases in Great Britain and the Federal Republic of (West) Germany. Following the Hunt Report, the new Ulster Defence Regiment (UDR) was raised and became the Home Service battalions of The Royal Irish Regiment when it merged with The Royal Irish Rangers to form The Royal Irish Regiment on 1 July 1992. Political negotiations eventually led to the operation being gradually scaled down until eventually all roulement units were withdrawn and Op BANNER ceased in 2007.